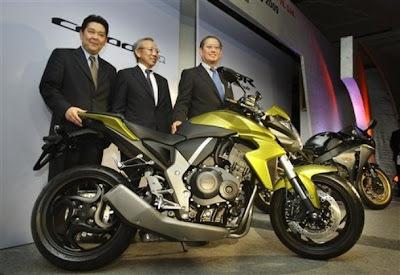 Honda Motorcycle & Scooter India Ltd. has launched its CBR1000RR Fireblade, to be available in the showrooms by March 2009. Sporting a price tag of Rs. 12.5 lakh, the superbike is targeted specifically towards premium customers. It comes in two colours- Achilles Black Metallic and Pearl Siren Blue. With its 180bhp inline-four engine, high-spec chassis and suspension and C-ABS anti-lock brakes, the CBR1000RR Fireblade is widely considered to be one of the best superbikes in the world. The machine's appearance is short and compact with the whole seeming to be drawn towards the centre of the bike in the pursuit of optimum mass centralization.The front cowl clings closely to the headstock, protruding as little as possible over the front of the bike in order to minimize inertia and maximize aerodynamic efficiency. Sleek bodywork provides the minimum resistance to the wind at high speeds, while incorporating the rider into an efficient part of the aerodynamic package.